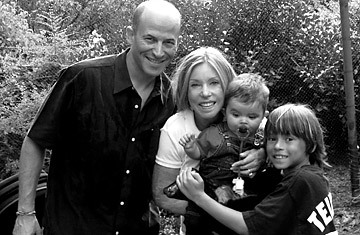 Lauren Manning, author of Unmeasured Strength, with her family. Most Americans will pause on the upcoming tenth anniversary of 9/11, taking a moment out of their year to reflect on the meaning of that tragic day. But Lauren Manning has lived with the aftermath of that event every minute of every day for the past decade. On September 11, 2001, she was a 40-year-old wife, a new mother and a successful investment banker at Cantor Fitzgerald. In seconds, all that changed; Manning, who was standing in the lobby of the World Trade Center when the building was attacked, suffered burns on more than 80% of her body. She tells the remarkable story of her journey back to health in her new book, Unmeasured Strength. When TIME met with Manning near her home in New York City, the author described her book as "an homage to all that are gone, who in many ways drove me toward life even in a more fierce manner." TIME: I was struck while reading your book that you never dwell on questions of unfairness or "why me?" You just moved ahead with determination. LAUREN MANNING: If we [look back] on every moment, if I think of events and times and places where I wished it had been different, it's paralyzing. I would have become a physical and mental basket case. And what would that have done to my family? What would that have done for me? Not much at the end of the day. TIME: How long were you away from home after September 11th? I was away six months and four days, to be precise. And then once I got home I went to the hospital every day for four hours of treatment, and I was back in and out of the hospital for periods of time too, with some additional early operations. TIME: How many operations did you have? Countless. I don't really know. A procedure could consist of a number of different operations, so they're well out of the single digits. Sometimes not knowing things is a good thing. TIME: It sounds like your husband has been wonderful. Yeah, he's a good egg, and through it all he's been right there by my side. I think back to him always looking to embrace or caress me, never being afraid to touch me, and the time when we first held hands [after the accident] and there was nothing but a mass of fabric and raised hardened edges. As the years went on he just stuck by me and he believed I would come back. That faith has always meant a great deal. TIME: I was very surprised that you could remember such a traumatic event with such specificity. I remember every last detail. We gloss over things that are difficult in life. But I didn't have that choice because I was going down while I was still in the building, so I had to summon every last bit of consciousness that I could gather to push myself through the pain, which only got worse and worse. It was really seeing the vision of [my son Tyler] that drove me forward. TIME: Your firm, Cantor Fitzgerald, lost 658 people. That must have been horrible for you. But they didn't tell you that immediately. No. It was a secondary loss that in many ways was much larger than the loss I felt for myself, because I didn't yet exactly know the true extent of my injuries. But to deal with hearing that so many were gone and then knowing that it was such a coordinated attack was tough. TIME: What was it like to finally go home after such a long time in treatment? It must have been both wonderful and startling. I was incredibly excited and a little apprehensive, and every day had been so long in so many ways that I felt as if I'd been returning after many years. I would have dreams of our apartment and what things were like and I realize that I was imagining a world that at once was so clearly only a few months in the past but yet a lifetime away. TIME: Tell me about seeing Tyler when you came home. The day I came home Tyler was napping. And to be sleeping next to my son a room away I felt that I could protect him and be there in the immediate sense, but it was hard for me to really do much with him. So I was present and yet I was still one step removed. TIME: It was quite a surprise in the book when you decided you wanted a second child. Not only were friends and colleagues and so many others gone, and the me that I'd lived with radically changed, but that archetypal dream of what one might want out of a marriage was suddenly in peril as well. We just wanted to build a family, so it took a number of years before I was even potentially able to do anything about it. When I reached a certain point of physical strength, I went to my doctor and he said, Well there's no reason internally why you can't have another child. They performed some tests and the endnote was unexplained infertility. And our doctor at that point said if you really want to move forward you should consider a carrier. So we began that journey, which was a multi-year journey. And finally against all odds at the bottom of the ninth with two strikes out [we had our son Jagger]. TIME: Do you still go through treatment for your health now? I do some PT still. The stretching and mobilization of joints and skin is very important, as it is for all of us. For me it's particularly important. TIME: Of course, I have to ask you how you felt when they killed bin Laden? I felt a certain vindication, but ultimately the root of the cancer has not been cured. To take innocents and to murder innocents is not the way to resolve, as a group of people, your own anger. TIME: Tell me about your life now. It's been a long journey. This is the beginning for me. I'm going to see where my passion lies and just keep working always. I couldn't imagine not. Could you? See photos of Ground Zero's evolution. See photos of the September 11 attacks.